The slow march of content to the Apple TV continues. 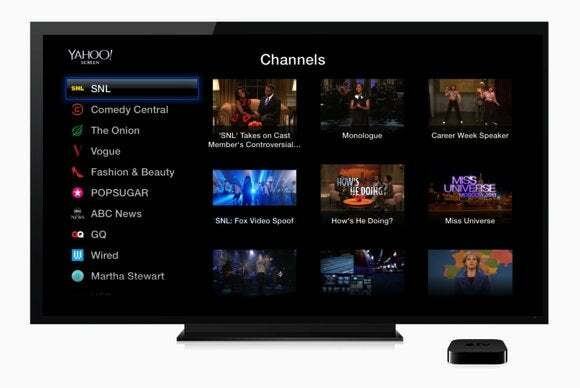 On Tuesday, Yahoo announced that its online video service, Yahoo Screen, is now available on Apple’s set-top box. And Yahoo’s not alone: PBS is also now streaming its shows to the Apple TV as well. Among the biggest draws of Yahoo Screen is an extensive archive of Saturday Night Live clips, along with content from Comedy Central—including The Daily Show and The Colbert Report—as well as The Onion, Vogue, GQ, and more. Earlier this fall, Yahoo launched Yahoo Screen, an app for viewing video on iOS devices; the service still hasn’t launched on Android. PBS, meanwhile, is offering episode of many of its popular shows, including Frontline. According to All Things D, the PBS channel will not offer live video streams, but will put up many episodes within 24 hours of broadcast. ITV’s Downton Abbey, which is one of PBS’s most popular shows, is not available on the Apple TV, due to a rights agreement with Amazon. While users don’t have to have a cable subscription to access the PBS channel, they are required to log in and identify their local affiliate. The addition of Yahoo Screen and PBS on the Apple TV bring yet more options to the set-top box, which has already seen quite a bit of new content added to it this year, including HBO Go and Watch ESPN, several offerings from Disney, and more. It’s clear that the war for the living room is heating up, and while Yahoo Screen and PBS probably won’t significantly tip the scales in that fight, they do at least reaffirm Apple’s commitment to expanding the content available on its platform. Updated at 7:53 a.m. PT to add news about PBS.